Beach: Just down the stairs! Spectacular views from one of the Cape's highest elevations! Enjoy your own private, sandy, Bay beach. 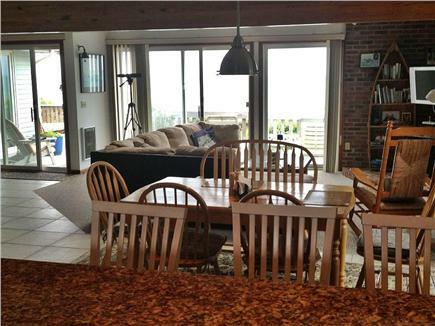 Water views abound from this spacious contemporary home with a wrap-around deck. 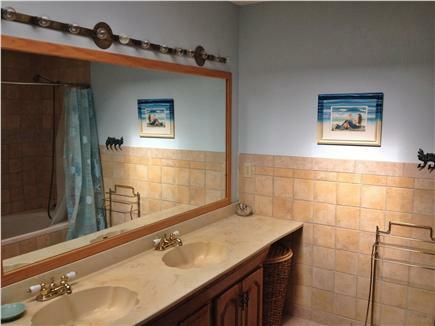 Many new upgrades including new tile, carpeting and all new appliances. A special amenity is the sunken in-deck hot tub overlooking the dunes and ocean. The ''great'' room (approx. 30' x 40') has cathedral ceilings and natural wood beams with all new tile and flat-screen TV, and the dining area is part of the great room. 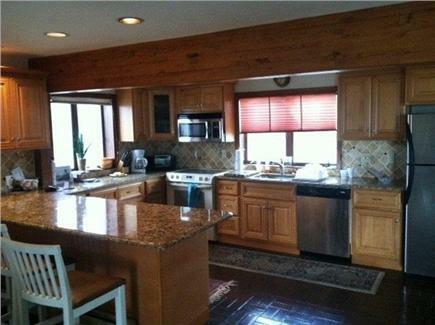 The gourmet kitchen offers a gorgeous ocean view and has been upgraded with granite countertops, new cabinets, a wine cooler and stainless appliances. Also on this floor are two large bedrooms. 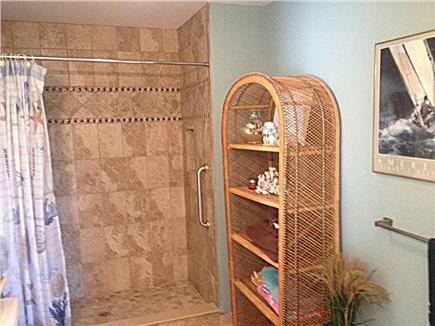 The master bedroom has bamboo hardwood floors, a king-size bed and a full bath with new tile. It leads to the deck and the 9-person hot tub. 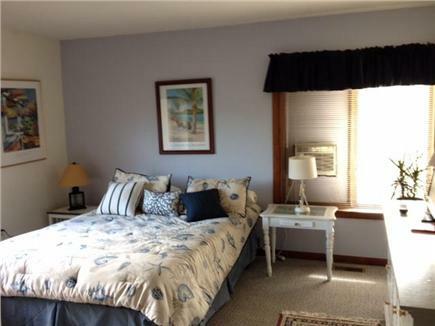 The other first floor bedroom has a queen-size bed and large bath. Upstairs, there are two more bedrooms; one has a double and floor-to-ceiling windows, and the other room has twin beds. 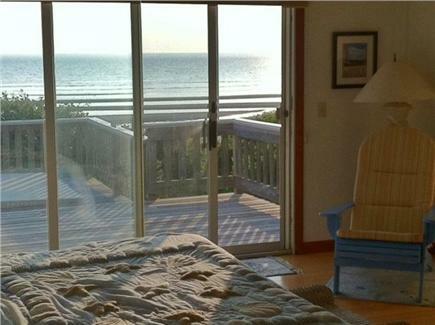 There is wireless internet access and a two-seat ocean kayak available for an additional fee. With owner's permission, pets are considered ONLY during the off season. 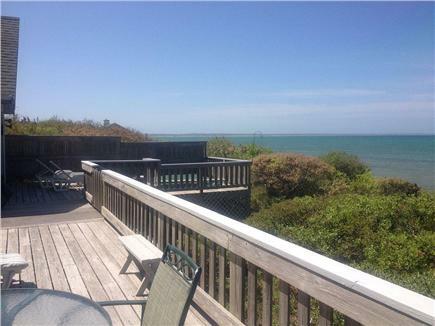 The property is 1.5 miles from the National Seashore Visitors' Center and Coast Guard Beach. It is also 3 miles to Orleans, which offers supermarkets, shopping and a plethora of great restaurants. Nearest beach: Just down the stairs! 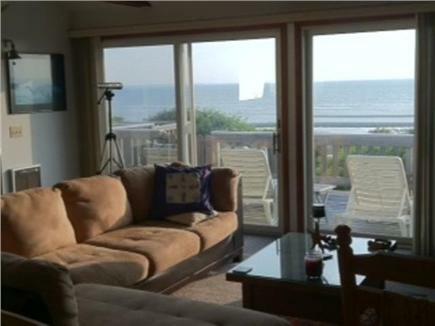 Long-Term Rental (1 month or more): Available off-season from mid-October through mid-June by the month. Price depends on number of occupants and length of stay (approx $1800-$2000/mo). Please call. Additional pricing info: Special discounted rates for off season with 3 day minimums,contact owner, State and local taxes of 12.45% will apply. Five steps into house. 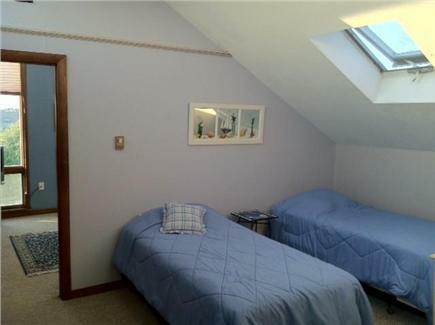 First floor bedroom with queen bed and adjoining bathroom with walk-in shower, including handlebars. What a beautiful place! It is a great place for the wedding. We definitely enjoyed our time here! I know that we can't live without Cape Cod and we will always return. Thank you for providing this amazing beach house for us to stay here. The beach, hot tub and weather are so great here! Thanks. This was the second year here for the B./G. Family. Again, we leave with our heads full of memories that will last a lifetime. 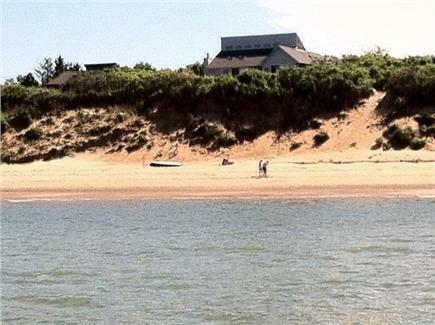 Great house, excellent temperature and what a beach! Stayed on the beach until sunset every day. The kids played on the sand bars in low tide and had fun in the water in high tide. Had great evenings on the deck and in P-town. We will be back! What a wonderful place! Weather not the best but it allowed us to visit Provincetown, Orleans, Brewster, and Boston without missing beach time. Visited Lavender Farm, saw a Cape Cod League Baseball game and the Hyannis Sound singing group. Earth House record store and bookstore in Orleans were great finds! The kids loved the amazing tides. Found lots of sea life at low tide and played bocci ball on the sand bars. My first visit was in early October 2001. 15 Martha was a warm and magical home to be in just after 9/11. The view is spectacular. 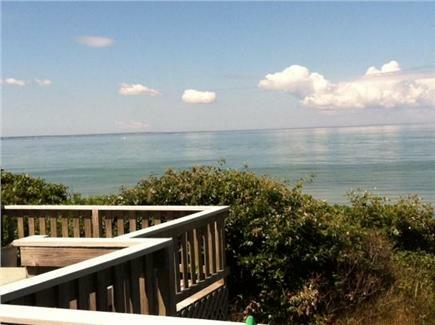 The beach is below the property, which is elevated, enhancing the view. Our home is located on a private road. Its open floor plan makes entertaining easy. The.wrap around deck is huge and the perfect spot for watching the sun set. The house is less than a mile to restaurants, general store, donut shops and two convenience stores. 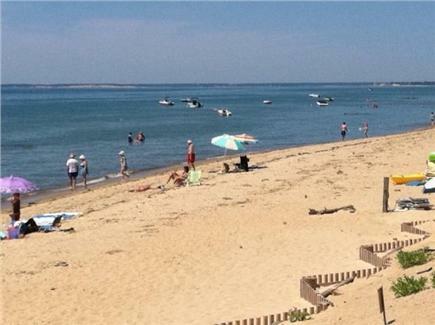 The town is set between the bay and the ocean with two of Dr Beaches favorites: Nauset Light and Coast Guard Beach. 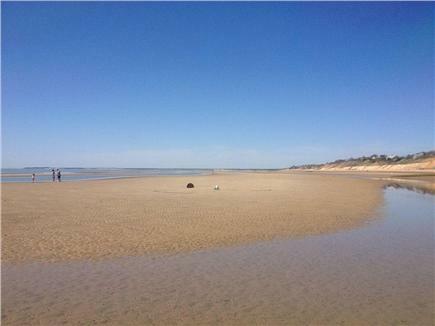 There are numerous bayside beaches for lowtide beachcombing..The Cape Cod National Seashore is a bicycling mecca with all levels of trails -- all are free.